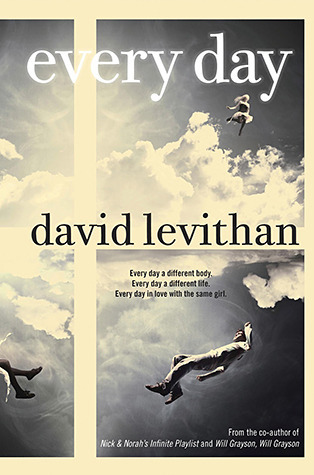 Every Day by David Levithan - Every day a different body. Every day a different life. Every day in love with the same girl. Ever since I first heard about Every Day, I've wanted to read it. I knew it would be great for LGBTQ YA Month, but I had enough books already and didn't want to over do it. But things changed, and I knew I just had to read it. And it may just be the most incredible book I have ever read. I don't think this book needs much of a summary. A wakes up in the body of a different person each and every day. He spends each day living their lives as best as he can, as they would, without too much disruption. He has no family or friends of his own, and lives a mostly lonely existence, never able to make any attachments. But when A meets Rhiannon in the body of her boyfriend, Justin, everything changes. He falls in love. I cannot tell you what a fantastic book this is. It's unbelievable! It's beautiful, it's heartbreaking, it's simply amazing! Seeing A go from body to body, life to life, not have one of his own, but trying so hard not to screw up the lives of the people whose bodies he inhabits each day is just so hard. It's all A has known, so he's now more philosophical about it than depressed. But every now and then something will happen where he wishes that this was his life, these were his friends, this was his family, this was his body, and he has a hard time. Yet we can learn so much from A! Having lived every day of his life in a different body, he's had first hand experience of so many different cultures, religions, sexualities, races, and of course genders. He's been in the bodies of drug addicts and in the bodies of the depressed. He's seen the dynamic between different families. He's seen the hardships people go through, and the trivial in comparison to the worries of others. He's seen and experienced so much, he simply cannot judge anyone. Because he understands. He's also very intelligent, and talks about how, despite our differences, we're all pretty much just the same. Watching A try to form some kind of relationship with Rhiannon when he's in a new body and new location every day is just so hard, but his determination to try something, simply because he can't bear to not be near her, is really the most wonderful thing. It really makes you think and question yourself. How far will you go for love? What would you do? What would you sacrifice? How hard are you willing to work? And at the same time, it shows us how the outsides, our looks, aren't really important at all. Who we are surpasses what we look like, and this is who we love. It's what's inside that counts. Or is it? Again, the question of how far will you go for love doesn't just come from A's perspective, but Rhiannon's too. This is such a beautiful love story! You'll notice that I've been referring to A as "he". This isn't correct. A doesn't have a gender. I will be using the generic "he" as "it" and "they" seem kind of rude. But yes, A doesn't have a gender. He's never had his own body, and spends time in the bodies of both girls and boys, he's just never thought that he has his own specific gender. This is something Rhiannon has some trouble with. When she knows about A's life, she struggles with being around him when he's in the body of a girl. That this person she's getting to know and starting to have feelings for... is a girl today. But as he explains, this is just who he is. 'She takes a sip of coffee, and I can tell another question's coming. "I know this is weird, but... I keep wondering. Are you really not a boy or a girl? I mean, when you were in [a girl's] body, did you feel more... at home than you would in the body of a boy?" It's interesting to me that this is the thing she's hung up on. This comes into play more when he finds himself in the body of a transgendered boy, and finds himself empathising to a certain degree. A understands what Vic has gone through, and by "accessing" - looking at the memories of the body he inhabits - he's able to tell us a bit of Vic's own story. Because of being in Vic's body, he is reminded of his own gender issues, and shares with us the problems he once had. Where Vic was born as a girl when he should have been a boy, A has struggled with not having a fixed gender in a world that says you have to fit into one of the two boxes. Accepting his genderfluidity took time. 'There are few things harder than being born into the wrong body. I had to deal with a lot when I was growing up, but only for a day. Before I became so adaptable--so acquiescent to the way my life worked--I would resist some of the transitions. I loved having long hair, and would resent it when I woke up to find my long hair was gone. There were days I felt like a girl and days I felt like a boy, and those days wouldn't always correspond with the body I was in. I still believed everyone when they said I had to be one or the other. Nobody was telling me a different story, and I was too young to think for myself. I had yet to learn that when it came to gender, I was both and neither. As well as genderfluidity and transgender topics, Every Day also looks at sexuality. A has been in the bodies of straight males and females, but also in the bodies of homosexual males and females, and has not had a problem. A himself is pansexual. The term "pansexual" isn't mentioned in the book, but I had heard of it before. Giving the extraordinary life A has, it's made understanding pansexuality easier; A doesn't see the gender of other people, he just sees people. He isn't attracted to girls and boys, but people. We discover more about how he thinks of his sexuality at a Gay Pride event. 'We come to the corner where there are a few people protesting the festivities. I don't understand this at all. It's like protesting the fact that some people are red-haired. As A is genderfluid, has no gender of his own, understanding his character and seeing him as someone without gender made it easier for me to understand pansexuality, because gender absolutely does not come into it. Bisexuality is attraction to males and females, pansexuality is attraction to "all"; gender doesn't come into consideration, and at the same time, the "pan" (meaning "all") includes, according to Wikipedia, those "who are intersex and/or fall outside the gender binary", like himself. I could go on about this book for ages, but I think my review is long enough. Every Day is so thought-provoking and so wonderful! There were passages in this book I had page-marked for myself rather than for this review, it's just so eye-opening and enlightening! Levithan is awesome with words, and through A, expresses emotions and feeling so beautifully, and filled me with such awe! The ending near killed me! I'm so glad to hear there is a follow on from Every Day coming out this August, Two Boys Kissing - it's one I am now eagerly awaiting! Every Day really is incredible. The best book I have ever read to this date. I couldn't recommend it enough! I really want to read this now. Fantastic review, it was great seeing the highlighted sections and getting a taste for the book. Thank you! I really hope you enjoy it when you read it! It's SO good!